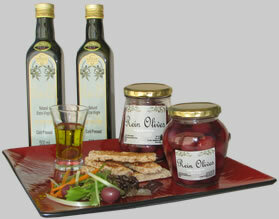 As much as we are proud of our Table Olive range, we are equally keen to talk about our Olive Oil product. SA-OLIVE has awarded us numerous Gold Awards for our Olive Oil range. Our Olive Oil has gone through 4 stages of pressing before it reaches your table. First passing through a course hammer meal and then the finer stage, the pulp is then injected into a high speed centrifugal chamber separating the purest virgin oil. This oil is then cold pressed for a finer quality yield. All remaining pulp and by products thereof are then returned to our Organic section of the farm as compost. Capturing the perfection of pure olives, our Olive oil is ideal for cooking & drizzling over salads, vegetables and pasta. Rich in Vitamin E, 100% natural, it is free of additives & preservatives, no cholesterol or sodium and contains less than 0.8% free fatty acids.